Cytosine (C), and Thymine (T). 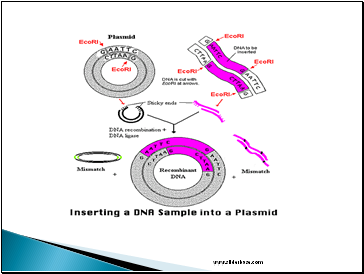 A plasmid a circular piece of DNA that exists apart from the chromosome and replicates independently of it. 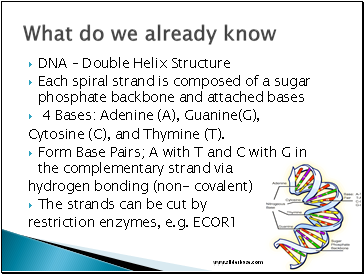 DNA that has been cut from one strand of DNA and then inserted into the gap of another piece of DNA that has been broken. The host DNA is often a bacterial cell such as E coli. The purpose of splicing the gene into the host DNA is to produce many copies of it. copies of the gene fairly quickly. The required gene e.g. 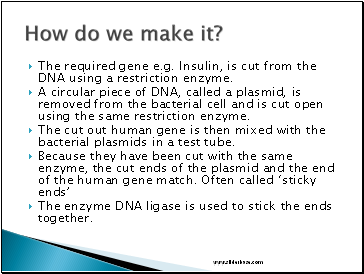 Insulin, is cut from the DNA using a restriction enzyme. 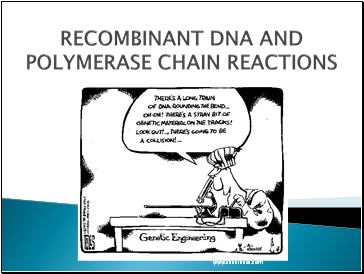 A circular piece of DNA, called a plasmid, is removed from the bacterial cell and is cut open using the same restriction enzyme. 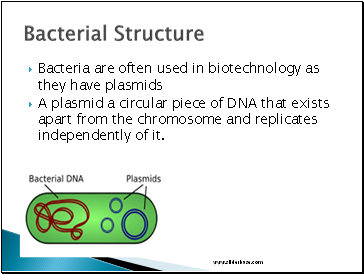 The cut out human gene is then mixed with the bacterial plasmids in a test tube. The enzyme DNA ligase is used to stick the ends together. How do we make it? 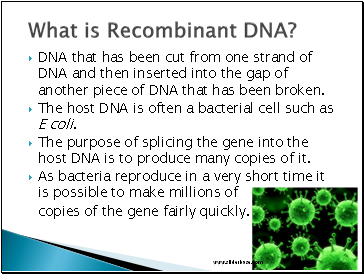 Now the plasmids that contains the introduced gene (recombinant DNA) need to be reintroduced into the bacteria so they can multiply and make more of the gene. 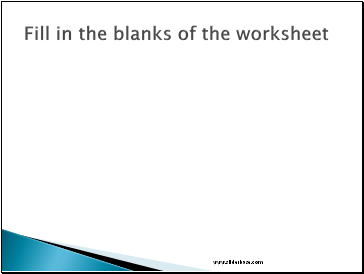 Can be done by combining them in a test tube with CaCl2. The high concentration of calcium ions makes the membranes of the bacteria more porous. 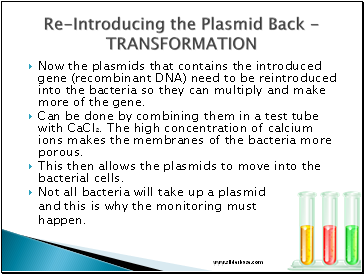 This then allows the plasmids to move into the bacterial cells.